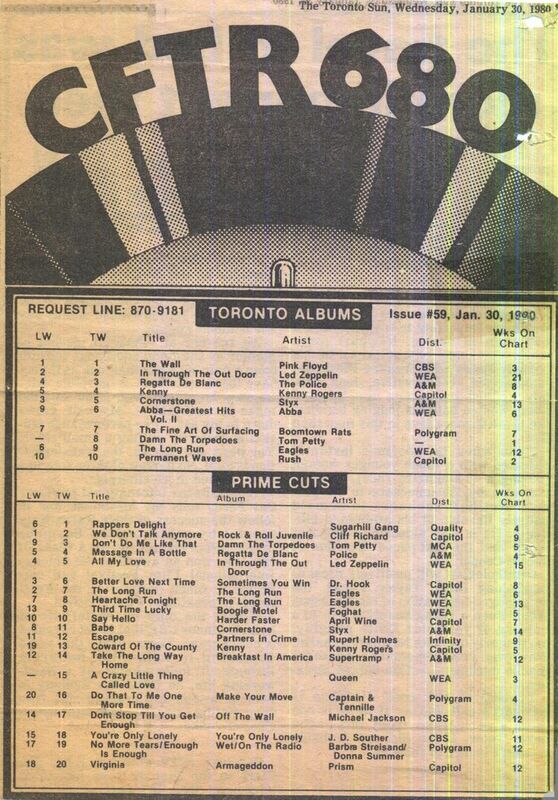 It was in the early 1970s growing up near Toronto that I began collecting records and music charts. Elvis was my first music hero. This was, looking back, a bit odd. In the early 1970’s he was at his peak with the legendary shows at Madison Square Garden, but at that point it was not cool in junior high and high school to be into Elvis. Although The Beatles had disbanded, I enjoyed discovering their music on my own and followed Paul McCartney & Wings because he was the rock star I wanted to be if I couldn’t be Elvis. I bought an old tube bass amp and a very heavy and cheap bass and tried to copy Paul’s bass lines. Sometime around Grade 8 I got a copy of Anthony Scaduto’s biography of Bob Dylan. I have no idea how much of it is fact versus fancy (with Dylan, who can know?) but the story captured my imagination. This prompted buying an acoustic guitar and then the obligatory harmonica and neck holder a la Dylan. Dylan was making some of his best music in the early and mid-70’s (I especially liked New Morning and Blood on the Tracks) and he became a gateway to music outside the Top 40. There was Laura Nyro, Gordon Lightfoot, Joni Mitchell, Bruce Cockburn, Neil Young, Leonard Cohen and others that were lumped under the title “folkies.” Thus with Ian and Tim I was cast into this subcategory. One didn’t necessarily get picked on for being a folkie, but neither were you part of the cool crowd, which consisted generally of two cohorts: the stoners — also known as “the Kodiak crowd” for their penchant for wearing untied Kodiak construction boots along with plaid shirts; and the jocks. These groups were not listening to Leonard Cohen. More likely KISS, AC/DC, Led Zeppelin, Rush, The Rolling Stones or perhaps local heroes Max Webster. In those pre-Internet, pre-CD, pre-MTV days AM radio was the most important musical channel. In Toronto it was 680 CFTR and 1050 CHUM. Each week they had their Top Singles and Albums Chart and each week I cut out these fascinating artifacts from the newspaper and organized them in a binder. Other than Paul McCartney, no one I followed ever made these charts. A memorable exception was Gordon Lightfoot’s hit “Wreck of the Edmund Fitzgerald.” But that aside, our “folkie” music heroes did not often appear on these sacred charts. Elvis and The Beatles were gods in large measure because they had reams and reams of Number 1 songs on the holiest of holies, the Billboard Hot 100. 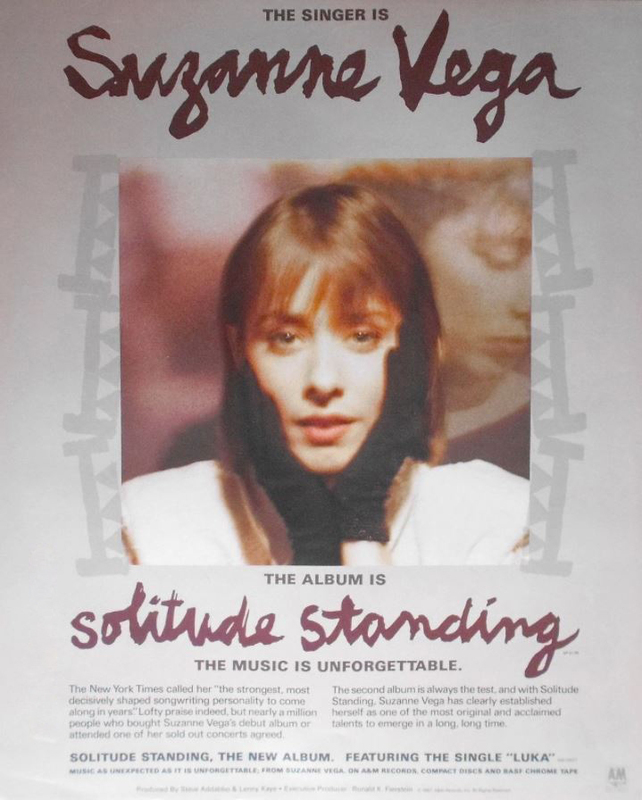 Which brings us to Suzanne Vega. She was a revelatory artist because she was the first performer we could follow from the beginning of her recording career, rather than second-hand like 50s Elvis or 60s Dylan. It was if her music was something that I had been waiting for and didn’t know it. Her first album floored us. We wore it out. It up-ended our assumptions about what was possible in pop music. We also thought that, like Leonard Cohen or Kate and Anne McGarrigle, Suzanne’s career was tenuous. Who knew what the record company might do to mess things up? Surely she was destined to inhabit the fringes of the mass market–more than a cult figure, but less than an artist of mass appeal. But to our surprise in 1987 Vega scored an even bigger hit. 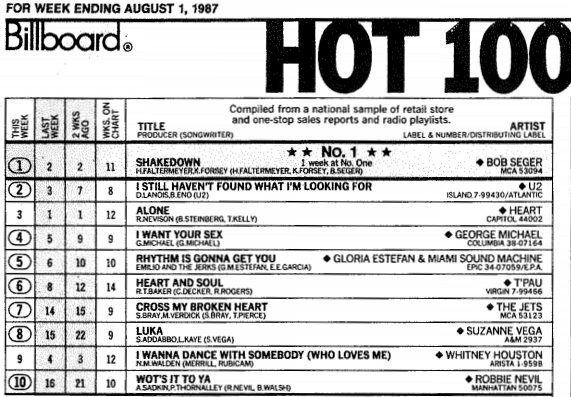 Like an accountant I tracked week by week the chart position of “Luka.” The first U.S. entry was the week of June 6, 1987, when “Luka” debuted at 93. That week Kim Wilde had the Number 1 position with “You Keep Me Hanging On.” The former No. 1 song “With or Without You” by U2 was now in 5th position. In North America, the buzz started a month earlier. 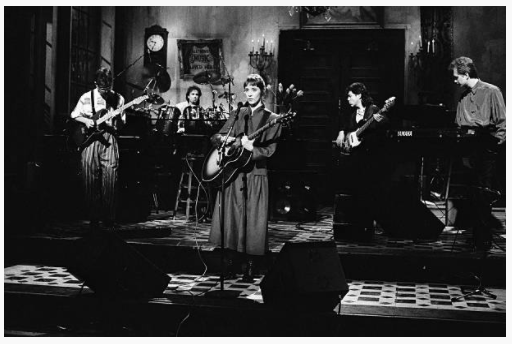 Suzanne and her band appeared on Saturday Night Live on May 9th 1987. This was a big deal. It was the premier showcase for a band in America. Because it was broadcast live, it was much more consequential than music video, more like Ed Sullivan than MTV. I suppose some people had VCRs to record the show but in 1987 those machines were still somewhat rare, especially if you were a grad student. The only way to see it was to make sure May 9th was cleared on your calendar and that you watched the show front to back. YouTube can make us take such appearances for granted now but in those pre-Internet days their ephemeral nature made us appreciate these broadcasts more and commit the performances to memory. 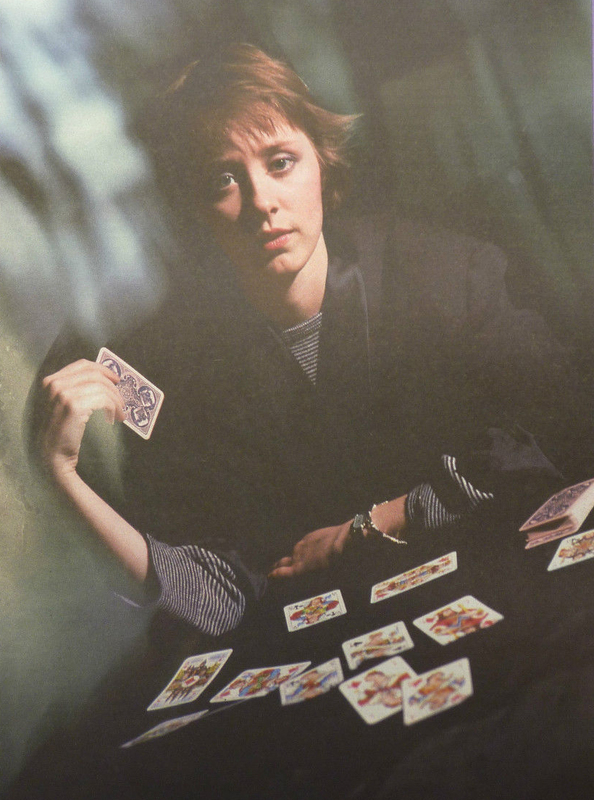 1987 was memorable, especially during its glorious mid-months, for a Suzanne Vega fan. All year the four note synthesizer introduction, the ringing guitar solo, and Suzanne’s distinctive voice was pleasurably inescapable. We could see the evocative black and white video continually on television. You could hear the song through car windows, in parks, and in shopping malls. I have a vivid memory: at the Citadel in Halifax, Nova Scotia for a big outdoor festival that summer, a DJ played “Luka.” For those three or four minutes the crowd of 20 or 30 thousand on the lawn of the vast park were transfixed by the song–a sea of nodding heads. When it ended, the crowd roared and it was played again. Suzanne was selling out Royal Albert Hall, Radio City Music Hall, and Carnegie Hall, which to me was unimaginably glamorous since this was stuff The Beatles and Dylan had done. Suzanne Vega, live at Carnegie Hall, NYC. 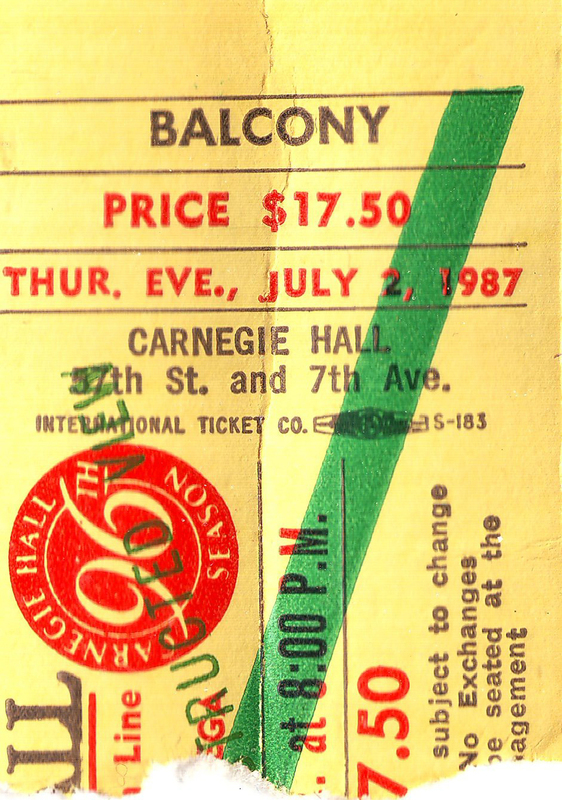 July 2nd, 1987. But what was one to make of the spectacle of Suzanne’s concerts? Here the latest cool crowd appropriated her for themselves, a few of them wearing clothes in the style of Suzanne. “Did you see her shoes?” said one girl to another in the row in front of us. I must have looked like Spock trying to compute why shoes would ever enter the equation of a music performance. What happened to the secret society that seemed to characterize the fandom of someone like Leonard Cohen or, I imagined, Suzanne Vega? Was this a hint of things to come? Perhaps the leading edge of an icy slope of hype and fame? Vega’s fame seemed a mixed blessing. It was fun to vicariously savour her triumph. Someone we thought was cool had made it–a literate, interesting person. Someone who didn’t look or sound like anyone else. It’s interesting how Suzanne Vega handled all of this. Along with a song like “Marlene on the Wall,” she has sung “Luka” at every concert she has played since. While she has experimented with relatively minor changes to the arrangement, she has remained true to the basic sound of the song, respecting her audiences expectations and memories (contrast this with the strong reactions elicited by some of Dylan’s infamous rearrangements–intended and otherwise–of his songs). As performed in concert, “Luka” has never come across as a chore or a millstone around her neck (as so many of Presley’s old hits seemed to him). And the song has never had the feeling of being the high-point or climax of her sets: both older songs–such as “The Queen and the Soldier”–and the newest ones can equally fight to take that honour. the map, without trying to replicate its success nor, on the other hand, deliberately distancing herself from it. As a performer, Vega became not so much a celebrity as a respected musical enigma. She is not a huckster. She is known, but her face is not plastered on every billboard nor paraded on reality TV. She has not worn-out her welcome. Her music is still not like anyone else’s and evades categorization. Afforded the resources a hit song and album gives you access to, Vega did not squander the opportunity on a repetition of Solitude Standing. Instead, she recorded days of open Hand, an ambitious, poetic exploration of alienation and then followed that with 99.9 F °, its equally ambitious, gregarious mirror twin. A trio of albums over a decade — Nine Objects of Desire, Songs in Red and Gray, Beauty & Crime — developed and displayed Suzanne’s facility for melody that more than anything else reminds me of Paul McCartney. These recordings also that started a transformation of her voice and expressiveness on stage that is now heard and seen in the songs of Tales from the Realm of the Queen of Pentacles (2014) and Lover, Beloved: Songs from an Evening with Carson McCullers (2016). I think these two recordings are by a good margin her best work so far. But that’s the way it ought to be. “Luka” hit its peak position of #3 the week of August 22 1987. In total it stayed on the Hot 100 for 19 weeks. A few months later Suzanne received Grammy nominations for Pop Female Vocalist of the Year (Whitney Houston won for “I Wanna Dance With Somebody”), Record of the Year (Paul Simon received the nod for “Graceland”), and Song of the Year (which went to James Horner, Barry Mann and Cynthia Weil for “Somewhere Out There”). Vega wrote about “Luka” in an article for The New York Times titled “Surviving the Hits.” I’ve always bristled at the application of the term “Two-Hit Wonder” to Suzanne. You never hear people riding Joni Mitchell for being a “One-Hit Wonder”. 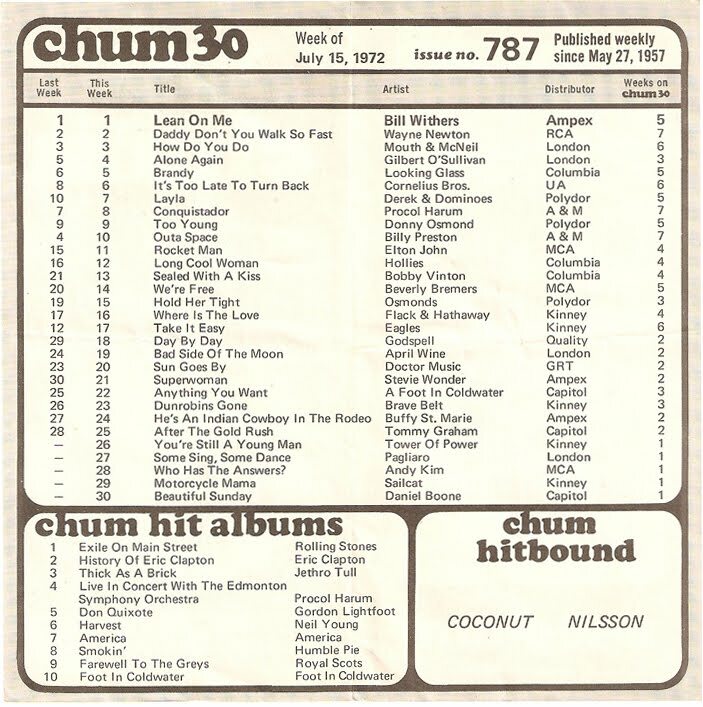 “Help Me” reached #7 the week of June 8th, 1974. It was her only appearance in the Top 10. Bob Dylan? He’s a “Three-Hit Wonder”: “Like a Rolling Stone” peaked at #2 the week of September 4th, 1965; “Rainy Day Women #12 & 35” reached #2 the week of May 21st, 1966; “Lay Lady Lay” reached #7 on September 6th, 1969. I think he survived those hits o.k. too. In his lifetime Leonard Cohen never had a song on the Hot 100. A month after his death in November 2016, his version of his song “Hallelujah” spent a single week on the chart at #59 on December 3rd, 2016. Leave me to my world, and I’ll leave you to yours. But one last thing I’ll say: we’ll never again agree on anything like we did about Suzanne Vega.